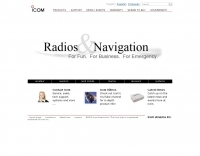 Com-West - We are Western Canada's LARGEST Amateur Radio Retailer. Although we specialize in Amateur Radio Equipment, we also have equipment for the scanner enthusiast. For our commercial customers, we have Land Mobile Avionics and Marine radio equipment. Search only in "Canadian Dealers"
Top Rated RadioWorld Inc. ELKEL Atlantic Ham Radio Ltd. Muir Communications Ltd - Victoria BC.